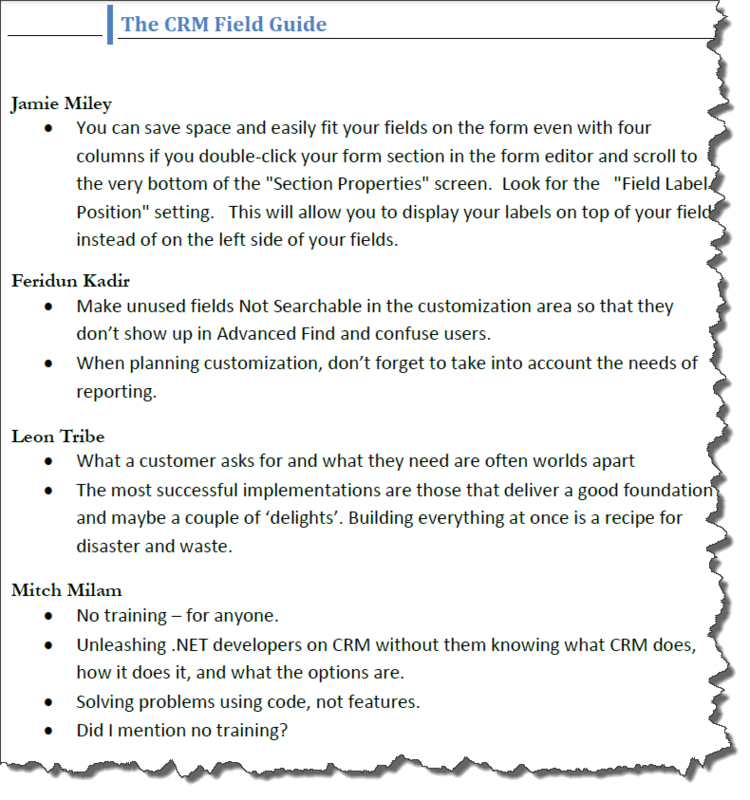 Each week over the next 6 months or so I will be doing a review of each of the 25 chapters in The CRM Field Guide – How to CRM Like an MVP with Microsoft Dynamics CRM. If you never had opened up the Dynamics CRM 2011 application then you will want to start with Chapter 1 (duh!). The first chapter introduces us to the CRM Application data construct. Don’t confuse this with a deep dive into the Metadata with relationship and key field ‘stuff’. It is a non-technical intro into application to give you a taste of the kind of record types that are built into the application. It is a perfect read for the future CRM Product Champion. The chapter then goes on to review the Ribbon bar, Charts and Dashboards, Customizations which is how non-coders are empowered, and touches on several other built-in features enable it to accelerate making it fit the way your business works. There have been entire books written on these features so don’t expect an everything you ever needed to know in this chapter. It gives you a great 30,000 feet view of the solution. Sure, there will be some developers out there that after perusing the first chapter they will say, I could do that with some .net Code. Well it is not quite that simple. The author introduces us to the built in features like Security Roles, field types, reporting and views. Simply put it would take eons of coding time to build this from the ground up with custom code. The chapter makes the case to mold the CRM application into the way your company works. But, perhaps the icing on the cake for the chapter is the Tips from the Experts section. Jamie Miley, Feridun Kadir, Leon Tribe, Mitch Milam, Scott Sewell, Joel Lindstrom and Donna Edwards each have contributed several tips, tricks and insights that have learned over the years. Here is a sample of some of the gems of wisdom from the chapter.